Over the last few years there’s been an increase in the number of us living in homes with more than one car. Research by Direct Line in 2013 found over 60% of their customers had two or three cars in their driveway, compared to just one in three homes which had a single car. If this sounds familiar, you’ll probably have already started to think about how you can make sure those cars are safe and secure. But how do you accommodate all these vehicles in your front garden while still making sure it’s attractive and appealing? 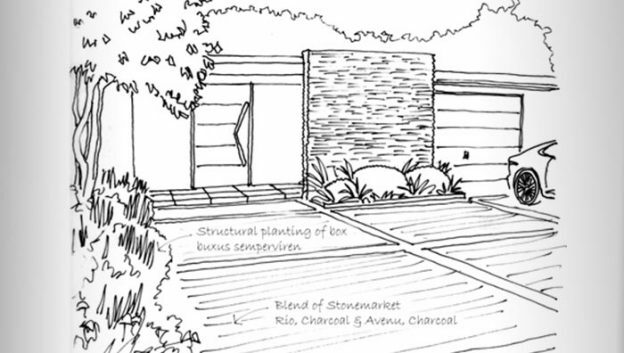 A garden designer can help you create the perfect balance between practicality and presentation. Here are four things to keep in mind when meeting them for the very first time to discuss your new and improved outdoor space. Space is a key issue if you’re a multiple car household. When planning the driveway section of your front garden, it’s recommended you allocate a 10ft width per individual car. It sounds a lot, but remember this is for the car plus door space so you can get out without a squeeze. On top of that, consider your own and your family’s routines – will it be impractical if one car has to be blocked in, and could you safely manoeuvre in and out of the driveway area when the other car’s parked? Next, look at the safety of the planned driveway area of your front garden. Will one car be hanging out onto the pavement? Are there trees or other shrubbery blocking your view of the road? While it’s not very exciting, get the safety basics right will mean you won’t be worrying about accidents and the driveway is easy to use. Installing convex mirrors at key points can be useful to help drivers – especially new ones – get out of the driveway safely. If you have the option, you might also want to consider installing gates to your front garden for an extra level of security. You can read more about safety precautions in our article. 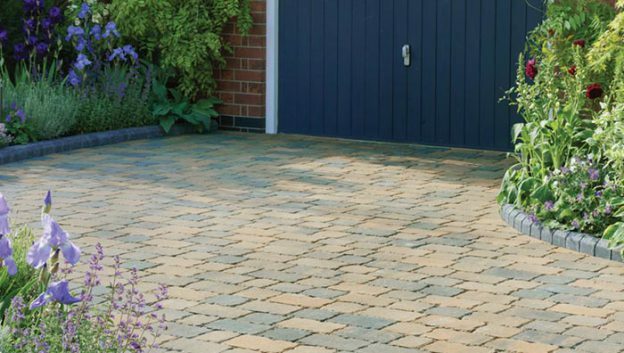 Once the planning and preparation is out of the way, you can focus on the fun part – making your front garden look beautiful, starting with the right surface for your driveway. A common mistake multiple car households make is to pave the whole front garden area, and in the same finish. This can look dull, uninviting and encourage water run-off. Instead, ask your designer to look at different surface colours or types, which will work in harmony to make the paved area a feature itself. 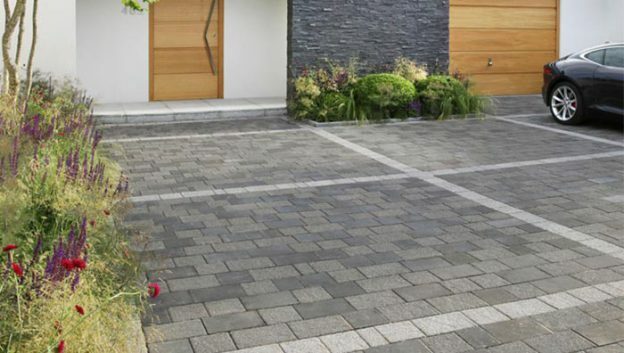 Elemental driveway setts are one way to do this – these ones come in three different colours, so you can blend them to add visual interest. 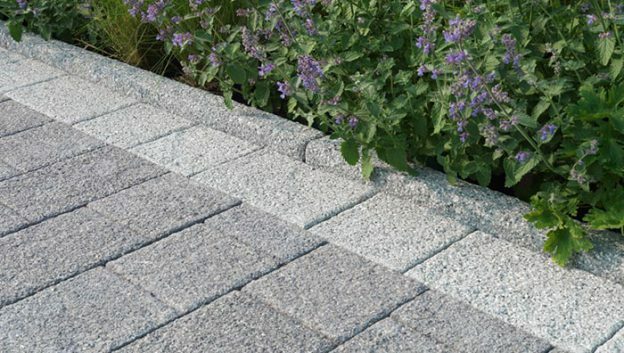 After finding the right surface for the driveway, a good designer will want to soften the effect of a large paved area by using planting and greenery. We recommend keeping at least some of your front garden planted, as it can help improve the surrounding environment by absorbing rainwater, purifying the air and much more. You can do this through planted borders nearer your house or at the edges of the paved area, or by adding tubs and hanging baskets for a splash of colour.